Berkeley is facing a housing affordability and displacement crisis. Low and middle-income residents are being pushed out of our city due to rising housing costs and evictions. Key to preserving our economic and cultural diversity is keeping people in their homes. To prevent displacement, I proposed that the city allocate $650,000 for anti-displacement programs in fiscal years 2018-2019. The Council allocated these funds to support eviction defense services, to expand our Housing Retention Program and fund a new Flexible Housing Subsidies Pool for the homeless. At the July 25th City Council meeting, we voted to transfer $300,000 of Measure U1 General Fund revenues to the Rent Board to expand on their existing eviction defense contracts with legal providers. Since there has been some confusion about the appropriateness of the council’s action, I want to clarify that Measure U1 was not a special tax and revenues go into the General Fund for use by the Council for municipal purposes. However, the measure does allow the money to be spent on affordable housing and preventing homelessness through eviction defense. The Council’s recent action to allocate $300,000 in Measure U1 revenues is consistent with the letter and spirit of the measure, which specifically discussed preventing homelessness. Funding eviction defense services so people do not end up on the street prevents homelessness. Read the ballot language here. Many housing experts, including UC Berkeley's Anti-Displacement Project, agree that helping people who are facing rent increases or evictions is a lot cheaper than building new affordable housing. This set aside does not betray the promise of U1 but rather works in tandem with our other initiatives to keep existing Berkeley residents from being displaced. If you still have questions, please reach out to my office. On Tuesday, Berkeley residents organized nearly 90 National Night Out block parties. I attended eight and it was great meeting new friends and hearing about issues of concern. When neighbors look out for each other, we're all better off. Thank you to all our hosts for organizing our neighborhoods and your contributions toward making our Berkeley a better place for all!! Last week, we kicked off a new partnership with Ford to launch an bike sharing system. Berkeley will have 10 bike share stations with a total of 120 bikes that residents and visitors can check out for an hour or an entire day! The bike stations will be part of a larger network that is encouraging Bay Area residents to get out of their cars and use a bicycle to ride to work, the grocery store or to BART or AC Transit. You can even use your Clipper Card to rent a bike. When the system is complete in 2018, Berkeley will have 37 bike share stations and 400 bikes in our city's 10 square miles. There are also bike stations in Emeryville, Oakland, San Francisco and San Jose. Check out a map of local bike stations. The City Council recently gave approval to put a port-a-potty at Alcatraz Avenue and Martin Luther King Jr. Way for general public use by the South Berkeley community. The port-a-potty will be paid for and maintained by Friends of Adeline, the organization that made the request, until a neighborhood public toilet policy is in place. The Berkeley Promise is accepting applications from first-generation college students from a low income family or from a group traditionally underrepresented in higher education. The 25 scholarships of $1,500 each will be given out by the Berkeley Community Fund. In addition to financial assistance, recipients will also receive mentoring to help them succeed in college. Those who successfully transfer to a 4-year university will have the opportunity to apply for additional scholarship funds of $8,000 over the span of two years. To be eligible for this scholarship students must be 2017 graduates of Berkeley High School or Berkeley Technology Academy and enrolled a Berkeley City College for the 2017-2018 academic year with the goal of transferring to a 4-year college. Young Lives Matter, a local nonprofit, has launched a new youth football and cheer league at San Pablo Park. The league is open to children ages 7-14. Practice is five days a a week from 4:30-6:30 p.m. Starting Aug. 26, practice will take place Wednesday, Thursday and Friday 5-7 pm. Registration $250 for football and $300 for cheer and scholarships are available. For more information, visit here. The City Council recently strengthened our Sanctuary City Policy to reinforce that there will be no collaboration with Immigration and Customs Enforcement, unless legally required. This amendment builds on our ongoing work to protect our undocumented community and to make Berkeley a city where everyone is welcome. Other work includes a Sanctuary City Task Force, convened by Mayor Arreguin, which is working to develop resources, protocols and a rapid response network in the event of immigration activity. The Council also approved the Mayor’s recommendation to allocate $50,000 in funding for legal defense services for people facing immigration enforcement proceedings. At its July 25 meeting, the City Council voted to direct staff to create a single, unified conceptual design for our Civic Center that incorporates the Old City Hall building, Veterans Hall and Civic Center Park. For generations, the Civic Center has been the heart of our city’s cultural and public life. However buildings like Old City Hall and the Veterans Building are seismically unsafe and are in need of renovation. design will create an inventory of needed repairs, seismic reinforcement and ADA accessibility. Civic Center Park is a wonderful amenity and has the potential to become a beautiful and dynamic gathering space for our community. The design process will engage the public and we invite all Berkeley residents to be involved. Needle Exchange Emergency Distribution (NEED), a local nonprofit that sends volunteers out to distribute clean syringes to intravenous drug users throughout Berkeley, will soon begin carrying naloxone, thanks to a nearly $11,000 grant from the city. Naloxone is a medication used to block the effects of opioids and has been extremely successful in reducing the number of fatal overdoses around the country. When given intravenously, naloxone works within two minutes, and when injected into muscle, it works within five minutes. The Berkeley Fire Department has carried naloxone since 1986. Opioid overdose incidents and deaths, either from prescription pain relievers or heroin, are a serious threat to public health. Between 2005 and 2016 there were an average of 11 opioid overdose deaths per year in Berkeley, according to the Berkeley Public Health Division. Since learning that another alt-right rally has been scheduled in our city on Sunday, August 27, our police have been taking steps to prepare. As a precaution, we encourage residents to avoid the Civic Center area altogether. If you do choose to attend and violence breaks out, we ask that you immediately separate yourself and call the police. In recent incidents, observers with smart phones have often blocked police officers from accessing the crowd, making it more difficult for them to do their work. Stand back, separate yourself from the violence and don't get baited by provocateurs. Even if many of our residents find the speakers’ message full of anti-immigrant rhetoric, conspiracy theories and paranoia fueled as a response to being left behind in a changing world, we respect their constitutional right to gather and express their views. However, I want to remind residents that inciting violence and making threats against certain groups is NOT a constitutionally protected right and will be dealt with immediately. 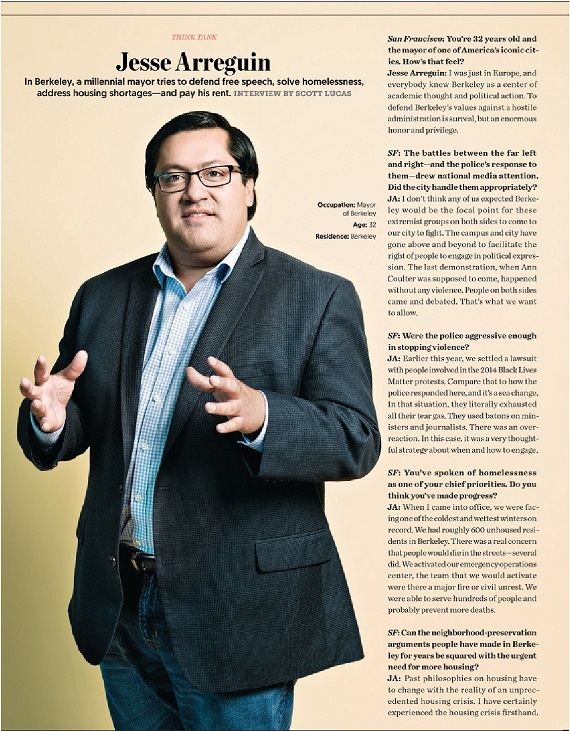 Jesse recently sat down with San Francisco Magazine to chat about what he is doing to address the housing crisis. We are approaching this challenge from multiple angles, including increasing the affordable housing fees corporate developers pay to build in our city, andbuilding more housing for the homeless. The interview also focused on how Berkeley is balancing freedom of speech with keeping residents safe. Visit here to read the article. This Saturday, Aug. 5, I'm joining Councilmember Kate Harrison at Berkeley Espresso, 1900 Shattuck Ave., for community office hours. Come say "hello" and let us know how we're doing and what you'd like to see improved in your community. 10-11:30 am. North end of Aquatic Park, 2031 Second St.
Bateman Mall Park, 3027 Colby St.
Join Berkeley Public Library for an outdoor yoga class at Bateman Mall Park at 3027 Colby Street, near Prince Street and around the corner from the Claremont Branch Library. Instructor Angela Madonia is back for this open-air program especially designed for families and best for participants ages 3 and up. The Parks Recreation & Waterfront Department is hosting four FREE outdoor Music in the Park Concert Series one Saturday a month in the afternoon from July – October featuring different bands and musicians. The second of the four concert series "Summertime Soul," featuring a kids’ zone with face painting, Boswick the Clown, bounce house and balloon art and more! Missouri Lounge, 2600 San Pablo Ave. The Fourth Annual Missouri Lounge Rescued Dog Pageant is a fundraiser for Berkeley Humane. All proceeds and a portion of bar sales will go to Berkeley Humane! The event will showcase dog costumes, talents and fashions accompanied by their owners set to a “walk out song” of their own choosing. This family friendly event will take place in front of Missouri Lounge. Chevron Auditorium in International House at UC Berkeley, 2299 Piedmont Ave.
Join K to College, a program of SupplyBank.org, to assemble 3,500 school supply kits and dental kits that will be given to students eligible for the free & reduced lunch program attending Berkeley Public Schools. Register to attend here. Join us to watch some of your favorite movies under the stars! The City of Berkeley's Recreation Division is hosting a FREE outdoor movie series on Friday nights in its beautiful parks, featuring some popular family films. A large portable 20' x 12' inflatable movie screen and premium audio visual movie equipment for outdoor cinemas make Movies in the Park a spectacular event. The sidewalks along Shattuck Ave. in the Gourmet Ghetto in North Berkeley are the target of artists young and old, professional and greenhorn during the 19th Chocolate & Chalk Art Festival on Sunday, August 27. This is a family-friendly free event produced by Another Bullwinkel Show, 510.548.5335, and sponsored by the North Shattuck Association, BETV, East Bay Loop, and the East Bay Express. The City Council closed its last meeting in memory of several notable community members who recently passed. Betty Olds, who served on the City Council for 16 years, was also a member of the Rent Stabilization Board, the Zoning Adjustments Board, the Berkeley Library Board, and a founding member of local environmental nonprofit Save the Bay. Alan Roberds, a 16-year veteran of Berkeley Police Department, will be remembered with great respect and camaraderie by the city and his fellow officers. Allen Stross was an avid photographer, member of the Commission on Aging, and a volunteer with the Berkeley Historical Society. My office is here to serve you. Give us a call or send us an email with questions or concerns.